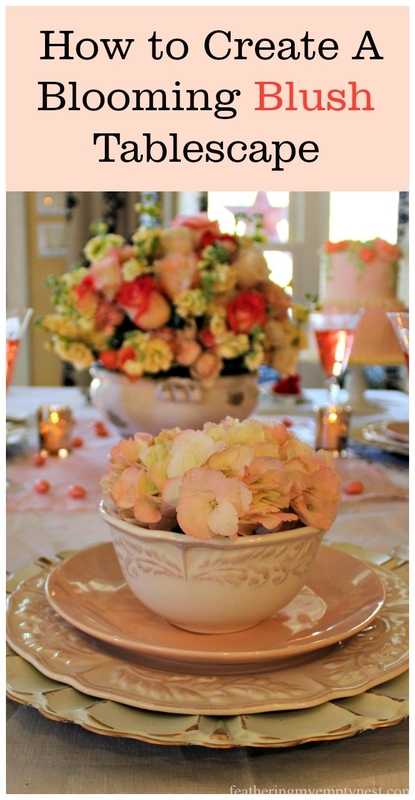 Every year, one of the things I most look forward to is creating a large floral centerpiece for my Christmas table. I always begin this process in competition with the herds of rampaging deer foraging in my yard for cedar, magnolia, boxwood, holly, and loropetalum. 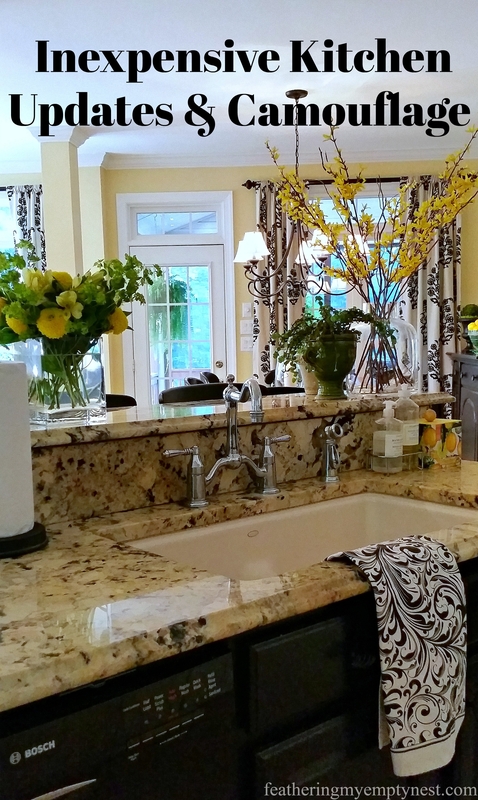 When I bring in this ridiculous overabundance of greenery, I then have to gild the lily by adding, roses, alstroemeria, mums, hydrangea, hypericum berries, fruit or whatever else is available in the grocery store to arrange quite a sizable centerpiece. I admit that I often get a bit carried away with this project–so much so, that my guests often feel like they have to peer through a thicket to see their dinner companions. Also, my dining room table is rather small, and my arrangements tend to take up so much space on the table that there is little room for the food. Fortunately, I have my priorities well in hand, and if I have a choice between food and flowers, flowers will win out every time. This year I had a Christmas centerpiece conundrum. 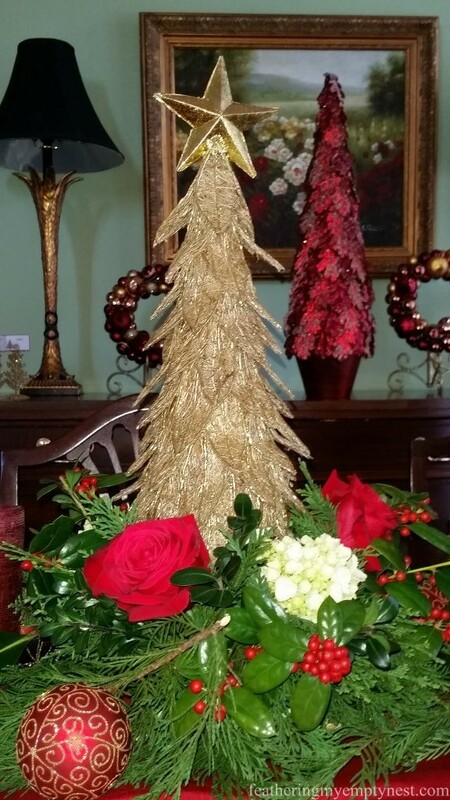 I wanted to use these unique gold mesh trees on my table, but I knew that they would not work with my usual giant arrangement. 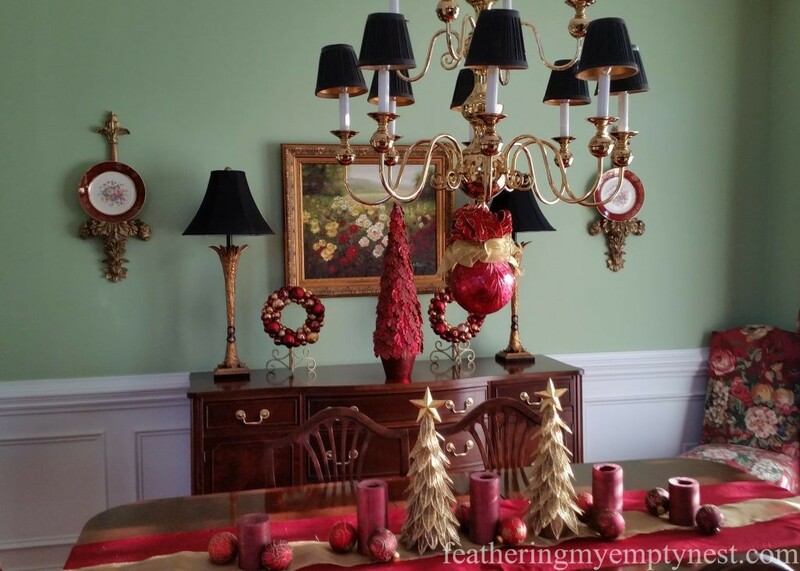 I always dress my dining table when I decorate my house for Christmas, and I did use the trees, along with pillar candles and red and gold ornaments on the table. 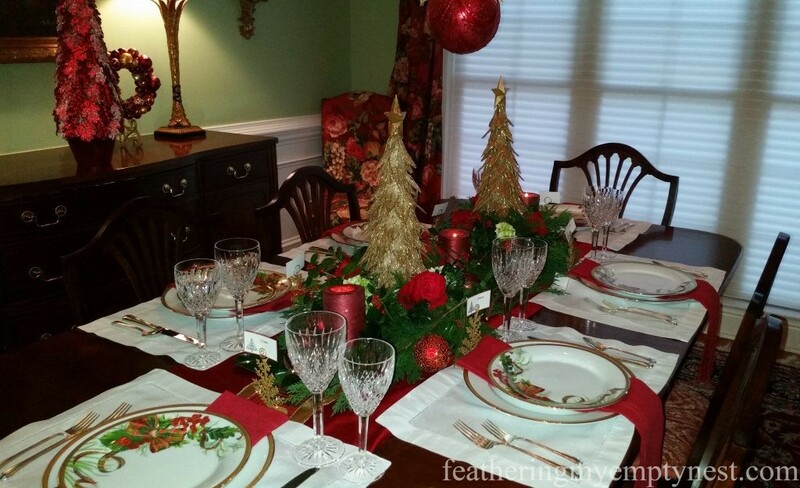 However, when I set the table for Christmas dinner I wanted to utilize the trees as well as flowers and greens in my table arrangement, and I wasn’t at all certain how to effectively incorporate all these elements into my design. I made the bases for the trees out of oasis which I set on small saucers to keep the wet floral foam from marring my table. 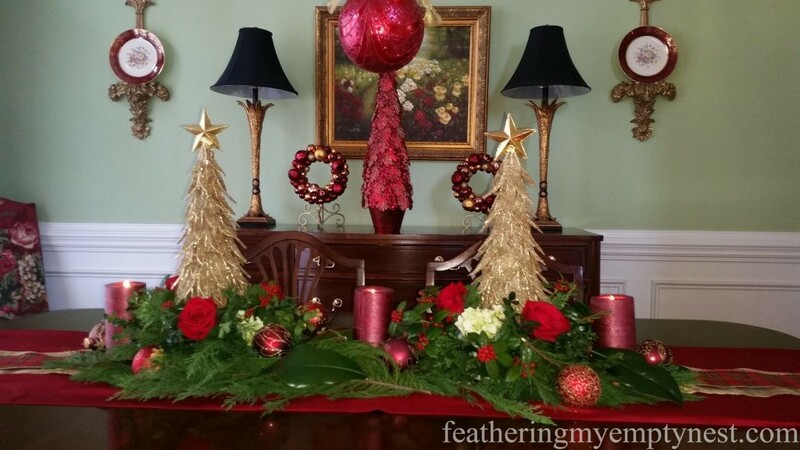 I then covered the floral foam with red roses, holly, hydrangea, and greens. 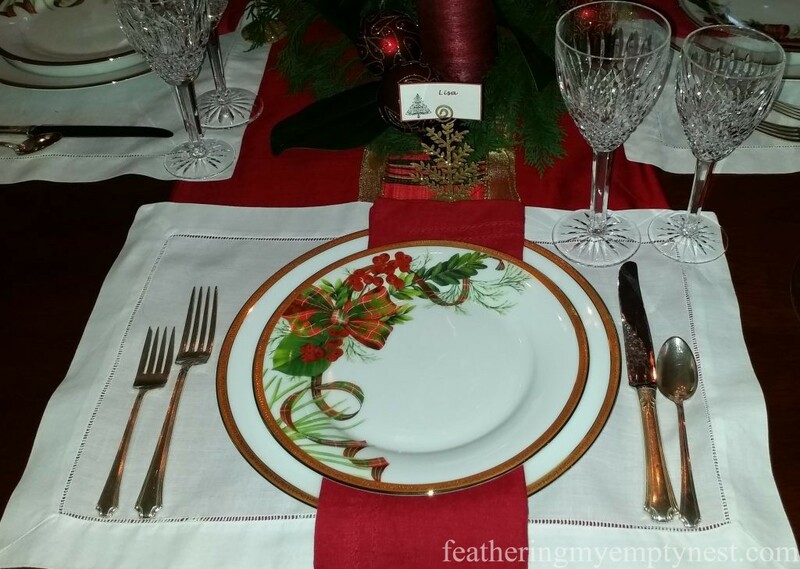 The place settings consist of Charter Club Grand Buffet gold-rimmed plates, red linen napkins and Charter Club holiday accent plates with holly and plaid bows. I added name cards in gold wire tree holders in front of each plate. Because my dining table is small (it only seats six comfortably), my centerpiece is ginormous, and I have to have a second table for the “kids” (two of whom are in their 20’s) in the kitchen, I serve buffet style. 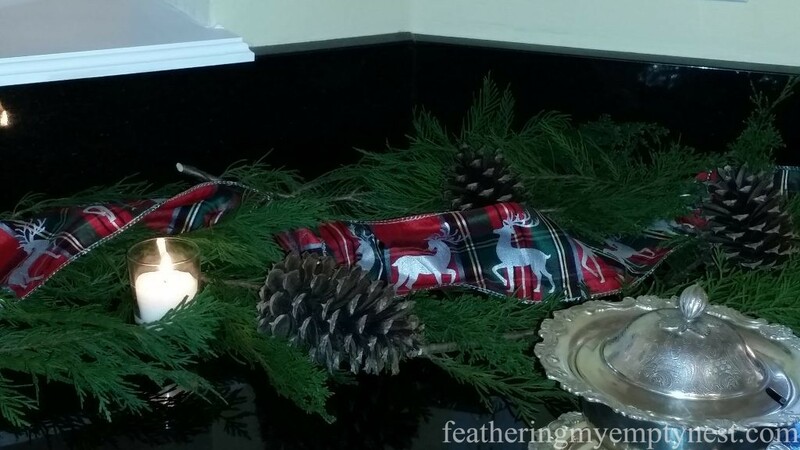 I set the buffet on the long counter in my kitchen, and I decorated it with cedar branches, plaid reindeer ribbon, large pinecones, and white votive candles. 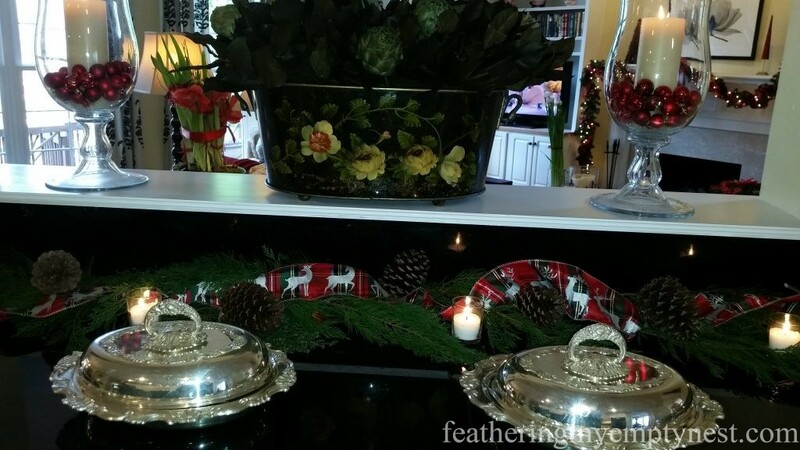 My Sheffield reproduction silver plate serving pieces were handed down to me from my mother-in-law. 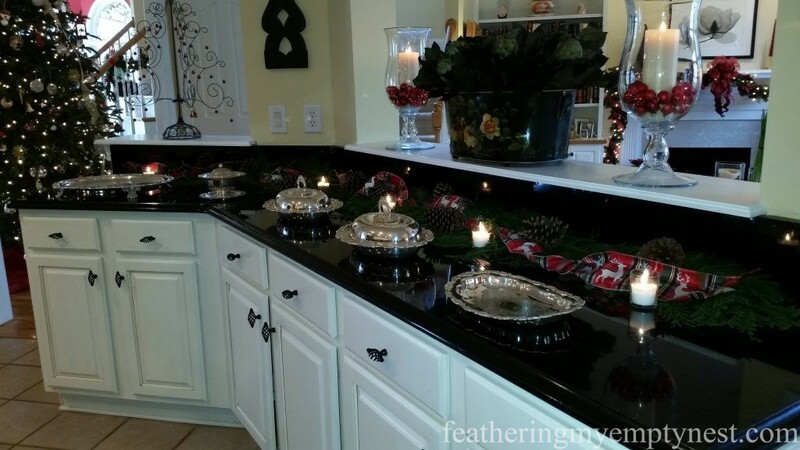 They are a bit of a pain to polish, but they really sparkle against the black granite countertop. While I wasn’t able to cut down on the extent of shrubbery on the table, I think in the end it was a was a satisfactory solution to my Christmas Centerpiece Conundrum. A great solution to your problem– although I have to admit, in the war between food and flowers, I’m likely to pick food! I love that ribbon with the reindeer– really cute! I love seeing all of your beautiful place settings. I envy the storage space you must have. 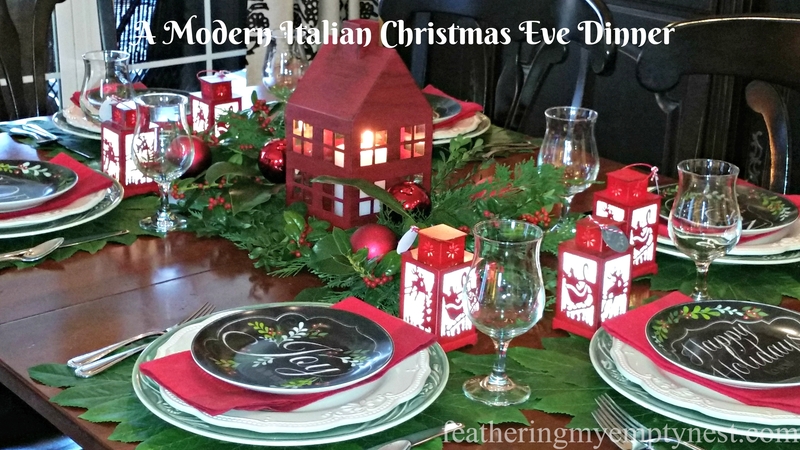 Between my everyday dishes and my set of wedding china–I am full up! You must have a well-planned method for organizing your seasonal things!